Music For Hope – Music for Hope is an international music initiative that gives a voice and expression to children and young people from poor, rural communities in El Salvador. Music for Hope is an international music initiative that gives a voice and expression to children and young people from poor, rural communities in El Salvador. Music for Hope started in 1996 as a collaboration between me; a then young enthusiastic music student, and a group of young musicians from the rural community of Nueva Esperanza. This was shortly after a brutal, twelve year civil war in El Salvador and the country was still reeling from the impact of this war. The young people I met had grown up in exile and had only recently been repatriated to El Salvador. Most had lost close family members in the war and had faced huge adversity in their short lives. I had a tremendous respect for people of the community and I wanted to give something back with the only medium I knew; music. So I returned to the UK and, supported by amazing friends and family, raised £400 to go to El Salvador the following year. This enabled us to buy basic instruments, a cassette player and for me to offer music teaching to whoever wanted to learn in the community of Nueva Esperanza. Teaching focussed on playing by ear, working with local songs and traditions and creating bands and ensembles. This short project was enthusiastically received and the community asked me to come back and work more widely across the Bajo Lempa. In 1998, I returned and established a model of teaching students, whilst also training young music leaders from five communities. The emphasis was on learning to play music as a means of expression, as a way of creating strong social bonds and solidarity between young people, of strengthening leadership skills and as an expression of pride in the communities’ political, social and cultural heritage. Since then, Music for Hope has grown beyond anything I could possibly have envisaged. We now support four local music teachers (all ex-students) and a coordinator working with around 200 young musicians a year from seventeen communities. Students learn new skills, make friendships, perform in bands and ensembles, write songs, and contribute to their communities through regular performances. We run eleven bands and a choir spanning a wide range of genres; folk, rock and popular. Many of these ensembles are performing at a semi-professional level at local and national events throughout the year. Since 1996, we have taught around 2,000 young people and adults, many of whom have gone on to access wider education opportunities, take up leadership roles in their communities as well as becoming accomplished musicians. Music for Hope students have become doctors, psychologists, primary school teachers, music teachers, community leaders, agricultural experts and many professions besides. If you visit the Bajo Lempa today, you will almost certainly hear the sound of guitars, singing and bands practising mingled in with a general rural soundscape of cattle braying, dogs barking and children playing. I am really proud that at it’s heart, Music for Hope is still a Salvadoran-led, grassroots initiative, that responds to young people’s desire to be creative, to have a voice and to give back to their communities. We have faced many challenges over the years mirroring the challenges of El Salvador as it struggles to overcome the impact of the civil war, political corruption and natural disasters. The issue of violent gang warfare is the biggest challenge we currently face which has threatened the stability, safety and social fabric of the communities. But our team continue to find ways to create safe spaces for our empowering music activities to take place, and in so-doing, are supporting a new generation of children and young people to negotiate the complex challenges that their communities and country face. Our team and the Bajo Lempa people are a constant inspiration and we are proud to be on this journey alongside them. We couldn’t have made it this far without the support of a network of friends who contribute monthly to our work, as well as our partners in Catalonia and funding from the International Performer’s Aid Trust and solidarity activists. 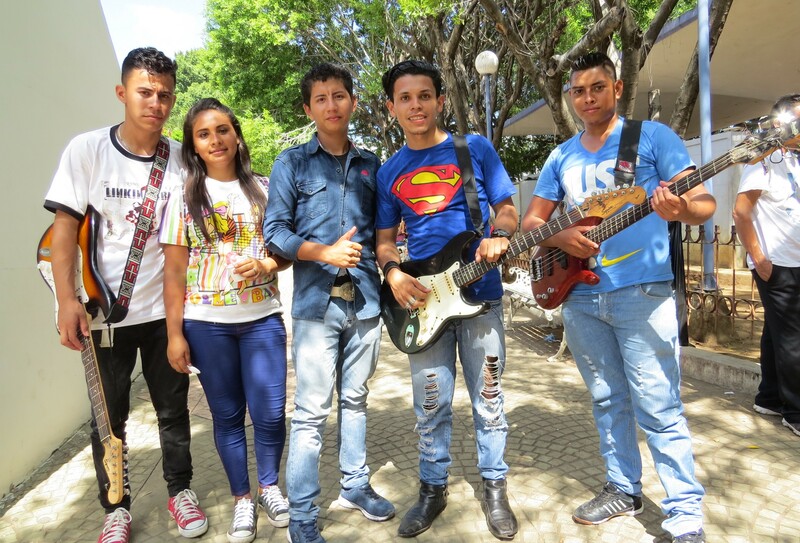 Music for Hope is a dynamic, community music project for young people from the Bajo Lempa of El Salvador, using participatory music as a tool for community development.